Hello dear friends! Martha Lucia here to wish you the west during this year! We are so happy to have you as visitor on Kennedy Grace Creations Blog and today I am sharing a card that I made with one of my favorites stamp sets, the Grace's Little Note but to make this I used Big Letters Die cuts! 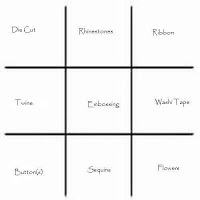 I made this card inspired on in our January Challenge, a great idea using the a Tic-Tac-Toe that our coordinator prepared. I selected the diagonal line: Die Cut, Embossing and Flowers! The easy way for my creativity time during this season of the year, because I am in transition time! Well the flowers came from the stamp set Grace's Little Note. I stamped them over whisper white cardstock using Versamark and then covered with Golden Flame Embossing Powder from WOW! I love this shiny touch that this powder gave to my flowers. 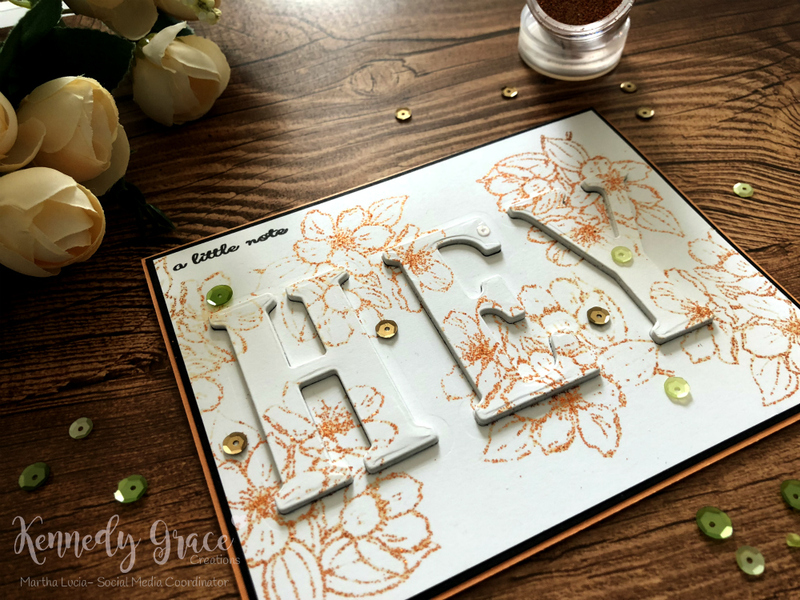 After melt the powder I cut the word HEY using the Large Letters Framelits Dies by Stampin Up. I also cut the same letters using white fun foam. I pasted the negative part directly over a basic black layer and then I paste the fun foam letters and the embossed letter on the same place. I just made this to create a high or have more dimension. Then I pasted the entire layer over the Peekaboo Peach card base. I stamped the little sentiment on the top using Versafine Onix and added some sequins from the collection Enchanted Evening. 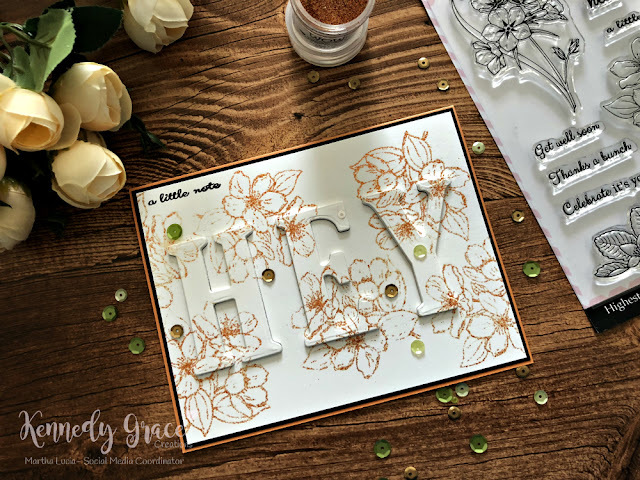 The best of this project is that you can take the idea and use this stamp set with a embossing technique or with another type of ink to let you coloring or watercoloring because always you will have an amazing creation with the Kennedy Grace flowers!